At long last, the World Cup kicked off in its most successful nation. With protests still ongoing off-the-pitch, Brazil were hoping to distract from those issues with a worthy performance. The final scoreline had more to do with some suspect officiating (and goalkeeping) than any majesty from a Brazilian team still plagued with the same problems since Dunga’s exit in 2010. Luiz Felipe Scolari sent out his team in a 4-2-3-1, while new Croatian manager Niko Kovac set up in a 4-4-1-1 with the youngest of his creative midfield trio, Mateo Kovacic, playing behind lone striker Nikica Jelavic. Contrary to Kovac’s claims before the game, Croatia did not appear to be concerned with keeping possession and did mainly look to park the bus. Nevertheless, there was no shame in sitting deep and letting Brazil have the ball as the hosts have frequently found it difficult to get the ball to their attackers. The opening game was no different. Whenever they won possession of the ball Brazil would routinely form a 3-3-4 formation: Luis Gustavo would drop between the centre-backs, the full-backs would push on a little bit to be in line with Paulinho and the attacking quartet would be out of reach high up the pitch. Cue endless passing backwards and forwards between the defensive players. Kovacic would try to stop the ball being played into Paulinho, while Jelavic watched Gustavo and Croatia’s two banks of four kept everyone else quiet. This difficulty in getting the ball to their creative players has often been a concern for Brazil despite their defence’s ability on the ball and wasn’t helped in this game by the unusual positioning of their attacking midfield trio. Typically, Neymar would be left and Hulk right of Oscar in the middle, but for this game they were rearranged, presumably so Neymar, their best player, could take advantage of defensive weakness in the centre of midfield. Instead it meant neither him nor Oscar saw much of the ball, while Hulk, whose physical presence might have otherwise given them a simple way of getting the ball into the final third, was wasted on the wrong side. The obvious method for Brazil to get the ball forward was via the full-backs, but their reluctance to venture any further than Paulinho meant this too was a squandered opportunity. Perhaps worries over leaving the defence exposed meant Marcelo and Dani Alves’ attacking instincts were curbed, but it didn’t really do them much good as the Croatians constantly caught Brazil out on the flanks. Sitting deep meant they had a lot of space to venture into whenever they snatched back the ball, so Ivica Olic and Ivan Perisic would drive towards the byline. If Luka Modric or Ivan Rakitic had the ball, they would run at Brazil, forcing players into confronting them to make pace for the wingers, or if Olic or Perisic already had it, they would steam forward and swing in a cross. The Croatians had already whipped two dangerous balls across the Brazil box before Marcelo bundled in their opener, and Jack Wilshere had exposed Brazil’s difficulty in having anyone willing to run at them way before this. 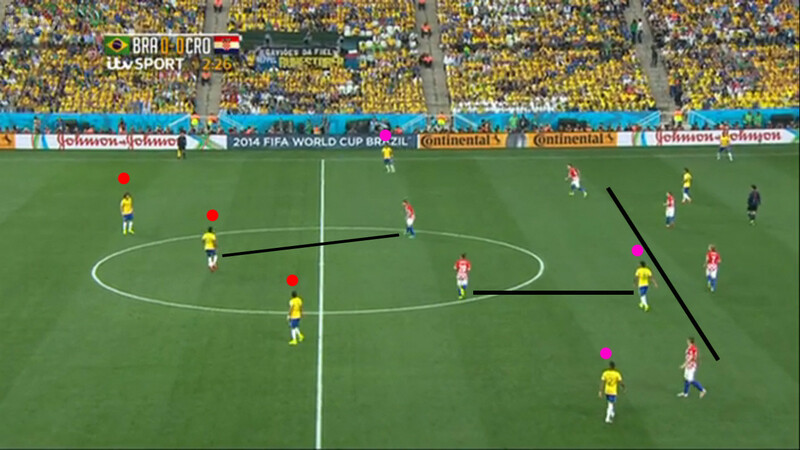 Croatia continued to look dangerous via this method, but Brazil did manage to save face after an embarrassing start. This came from two changes: firstly, the full-backs now drove forward, deep into Croatia’s half, allowing Brazil to hit longer diagonal balls towards them; secondly, Oscar and Neymar starting to come short to pick up the ball, allowing for passing moves that weren’t just sideways balls between the centre-backs. These changes had the best effect on Oscar, who had been anonymous for the early part of the game. A frequently repeated move due to its success for Brazil involved him coming short to pick up the ball and drawing players in while Dani Alves stormed past him, left in space as Ivica Olic was reluctant to follow the full-back that deep into his own half. Oscar’s scrambled assist for Neymar’s equaliser exposed the Croatian midfield’s lack of ball-winning ability to some extent, and it was his cross that led to Fred’s penalty topple, but obviously his toe-poked finish to seal the victory was his finest contribution. Equally, each of those goals should have been stopped by Stipe Pletikosa however and there were some huge question marks caused by the referee’s favouritism towards the home team that left a sour taste about what should have come across as a fairly convincing win. For the most part, the hosts weren’t good, and for the same reasons that have troubled them for several years.